Getting creative with the sculptor's gouge allows everyone to reflect their own personality in their work. Whether you're a beginner learning the basic techniques of sculpting, or a more advanced student creating a human head or a more complicated sculpture - you will always end up with a completely individual creation of which you can be proud. "Better than a spa break!" "You can really give your creativity free rein." 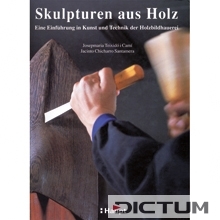 A highly detailed instruction manual, a comprehensive reference book and an inexhaustible guide in one - this equally useful and interesting basics book provides a sound introduction to the art and technique of wood carving for sculptors of any level - from beginners right through to professionals (in German).